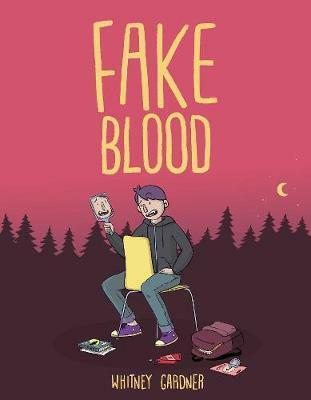 A middle schooler comes head-to-head with his vampire slayer crush in this laugh-out-loud funny graphic novel that's a perfect coming-of-age story for anyone who's ever felt too young, too small, or too average. It's the beginning of the new school year and AJ feels like everyone is changing but him. He hasn't grown or had any exciting summer adventures like his best friends have. He even has the same crush he's harbored for years. So AJ decides to take matters into his own hands. But how could a girl like Nia Winters ever like plain vanilla AJ when she only has eyes for vampires? When AJ and Nia are paired up for a group project on Transylvania, it may be AJ's chance to win over Nia's affection by dressing up like the vamp of her dreams. And soon enough he's got more of Nia's attention than he bargained for when he learns she's a slayer. Whitney Gardner is an author, illustrator, and coffee addict. Originally from New York, she studied design and worked as an art teacher and school librarian before moving to Victoria, British Columbia, where she lives by the Salish Sea with her husband and two pugs. In the rare moment Whitney isn't writing or drawing, she's likely to be reading comics, knitting, or roasting coffee. Her books include the YA novels You're Welcome, Universe; Chaotic Good; and the middle grade graphic novel Fake Blood. Whitney Gardner is an author, illustrator, and coffee addict. Originally from New York, she studied design and worked as an art teacher and school librarian before moving to Victoria, British Columbia, where she lives by the Salish Sea with her husband and two pugs. In the rare moment Whitney isn't writing or drawing, she's likely to be reading comics, knitting, or roasting coffee. Her books include the YA novels You're Welcome, Universe; Chaotic Good; and the middle grade graphic novel Fake Blood.